Under the Sea Kid Activity Page - Home. Made. Interest. 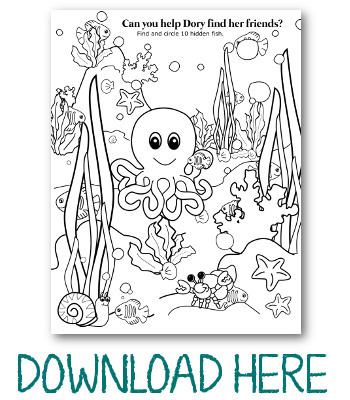 This simple Under the Sea Kid Coloring and Activity Page is a great summer activity and it is perfect for road trips with the kids especially if they love Disney Pixar’s Finding Dory! Sometimes you just have one of those weeks. You know what I mean. You have a million things to get done around the house and instead of being able to send the kids outside to play while you try to catch up on stuff, it rains…for 15 days straight. That’s not a typo guys, 15 DAYS! Up here in Maryland we’ve had an unusually chilly and wet spring which means we’ve been stuck in the house way too long! During all of that rain I’ve had to get pretty creative with ways to keep the kids entertained. If I try to look at the bright side at least it has helped me stock up on ideas for keeping the kids busy this summer. One of the easiest things I came up with was sitting the kiddos down with some colored pencils to work on activity sheets. They love finding the hidden pictures, coloring the pages, and working their way through mazes. 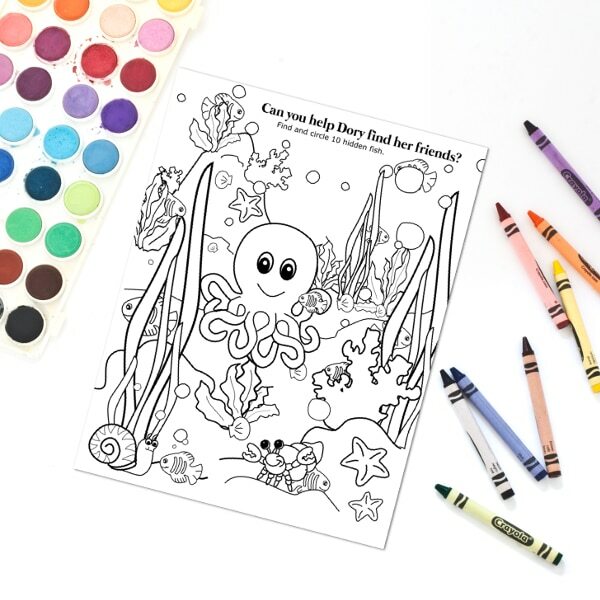 They enjoyed it so much I created some of my own kid coloring pages including this fun underwater activity page where the kids can help Dory find her friends! 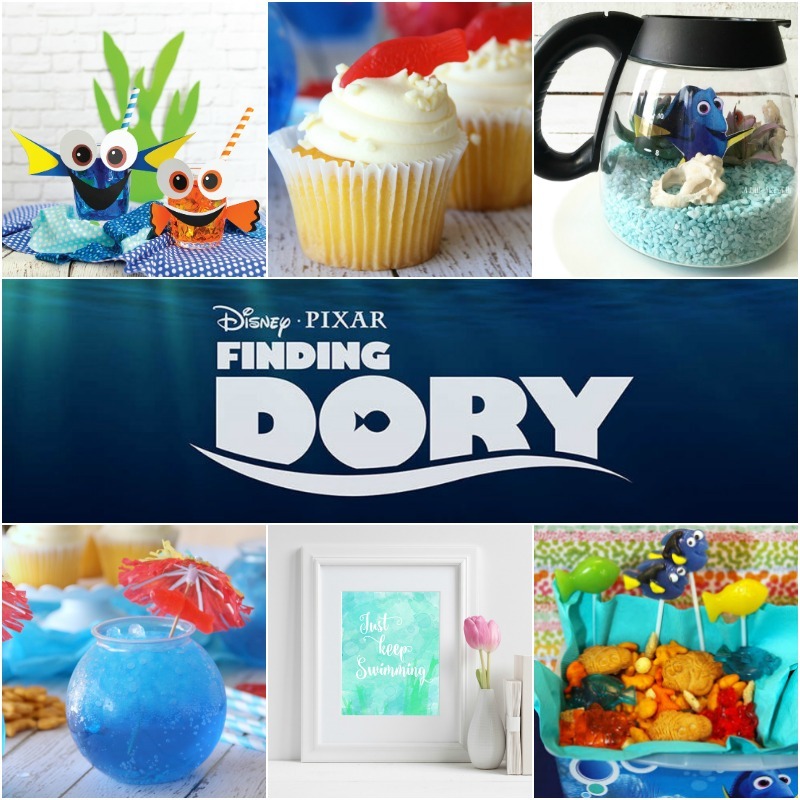 I chose the underwater theme because my family has been a little obsessed with Disney Pixar’s Finding Dory. Are you guys as excited about it as we are?! Between searching out Dory’s fishy friends, and coloring in all of the sea creatures, this simple activity page gives me just enough time to get lunch made and on the table. With all of the rain and cool temperatures, we’ve been eating a lot of Campbell’s Soup and grilled cheese sandwiches. Am I the only one who thinks this is the perfect rainy day food? 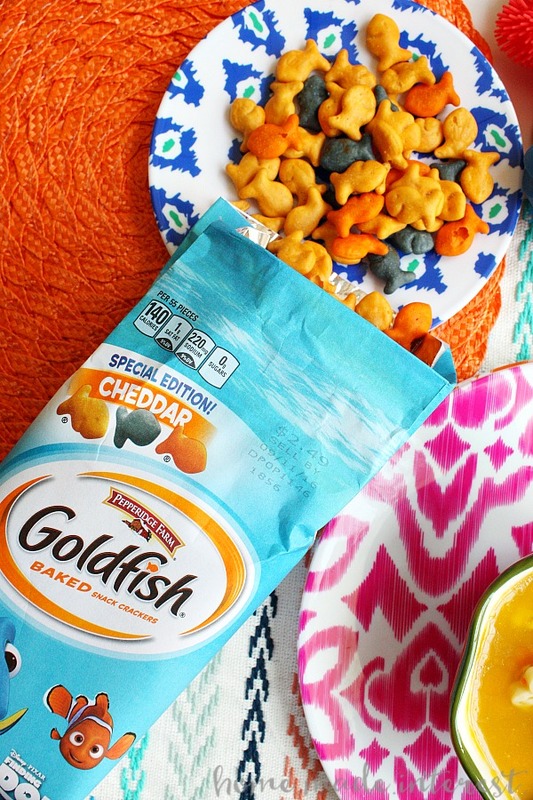 Add a few Goldfish® crackers in and you’ve got yourself a pretty fun lunch! I even managed to find Goldfish® Special Edition! 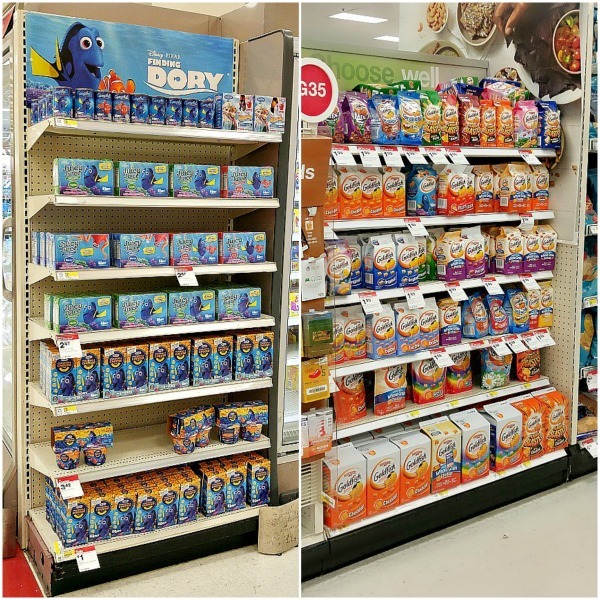 Cheddar Disney Pixar’s Finding Dory Crackers and Campbell’s Soup featuring Disney/Pixar’s Finding Dory at Target (and I had coupons! HERE & HERE). My kids were pretty ecstatic about that. The Goldfish crackers come in special edition colors and the Campbell’s Soup is chicken with pasta in fun sea shell, Dory, and Destiny shapes in chicken broth. 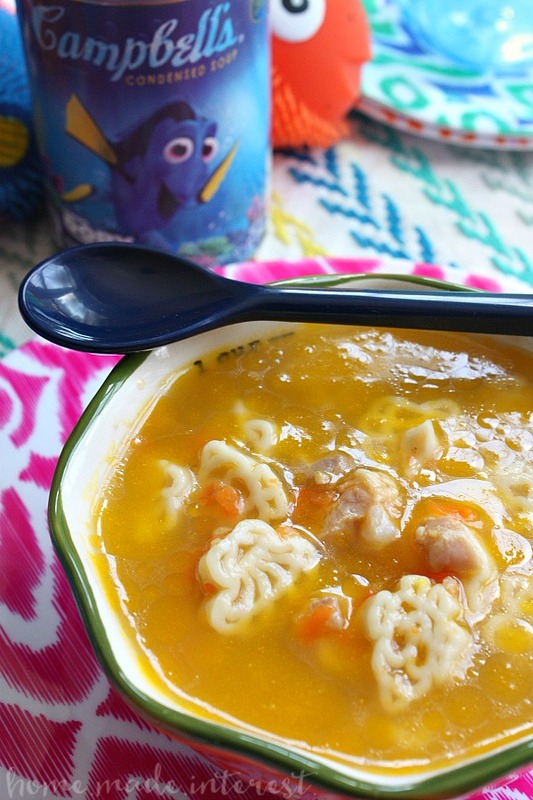 You can find the soup in 3 unique labels featuring Dory, Nemo and Hank. Of course we had to get one of each because we love all of the characters. That wasn’t a problem though, because when it rains every day for two weeks you need a lot of warm Campbell’s Soup and Goldfish crackers to make it through. These two things, plus coloring pages and activity sheets may be my secret weapon for getting through rainy days this summer! I know you’re going to want to run out and stock up on Goldfish® Special Edition! Cheddar Disney Pixar’s Finding Dory Crackers and Campbell’s Soup featuring Disney/Pixar’s Finding Dory! 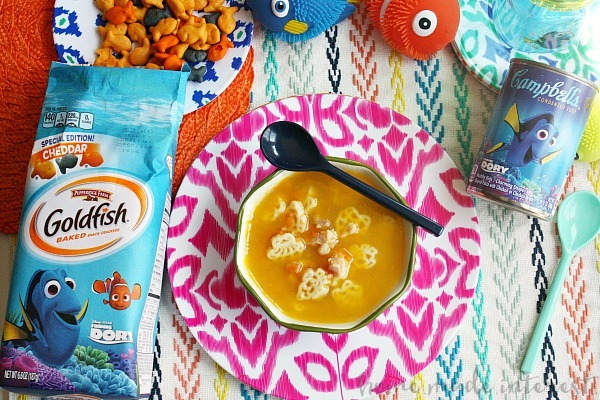 You can find them at Target and I even have some coupons for you: 20% off Goldfish crackers featuring Disney-Pixar Finding Dory (COUPON) & 10% off Campbell’s Dory Healthy Kid’s soup (COUPON). Oh, and don’t forget your Under the Sea Activity Page. Your kids are going to love it! What kind of fun things do you have planned to keep the kids entertained this summer?